UV-varnishing is very popular in the printing finishing of printed products. This proved true, is the fact that using a UV-varnishing you can get a wide range of aesthetes-optical effect, giving unique, directly originality and sophistication. With UV-varnishing we can to achieve magnificent gloss. This greatly changes visual perception of the image- color under UV-varnishing is look more intense. UV varnishing is perhaps the continuous and selective. You can use the matt and high-gloss UV varnishes. All of this gives to product: solid, presentable view, and also responsible for its longevity. Folding - it is a mechanical process folding sheets of printed materials for forming a smooth bend. Folding made on special rebate machines. 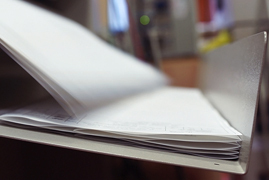 Folding is carried out a specific pattern, which provides the correct sequence of pages in the finished product. The line is called the folding seam. For example, if the sheet is folded in half, you get a booklet having a fold (one fold). Folding allows keep the product good form. To achieve amazing aesthetic effect when creating brochures use a variety of printing techniques: embossing, UV-varnishing, stamping, die-cutting, matt and gloss lamination cover. Therefore way brochures emphasizes individuality and always will have a huge the impact on the formation of a favorable image of your company. Stamping - one of the most popular methods of postpress, which allows changing the texture of the surface of the printed products. 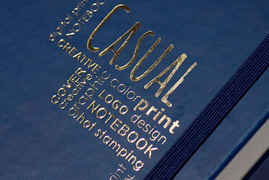 Stamping or embossing creates a clear pattern, unattainable by other methods. It gives the surface extraordinarily beautiful and graceful look. Stamping like animates products endowing them with sensuality and warmth. Increasingly becomes more popular stamping foil. 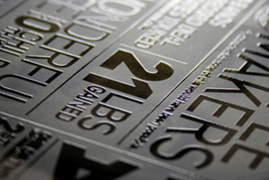 It is applying a metal foil texts, patterns or elements image, create the effect of gilded or a silver surface. Also in the stamping, besides gold and silver used colored foil: red, green, blue, yellow, pearl, holographic, diffractive etc. Printing products, stamping foil becomes incredibly attractive, luxury and value and a positive effect on the image of a computer-research institutes. Lamination- is process of refinement of prints by coating special polymeric plastic sheet. The main goal of lamination is rising to attractive appearances of products and the protection at injury. 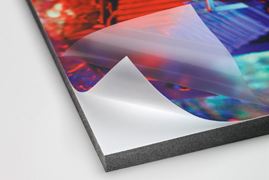 With using lamination, papers are turns glossy effect and rise saturation colors, the brightness of the printed products. There are many types of plastic sheet for the lamination: glossy, matt, colored, holographic, and diffractive etc. They differentiate in thickness and texture. To make the product more rigidity thick plastic sheet types used. Lamination protects products from damage and allows it to prolonged time to keep its original attractive. Stamping - one of the most popular methods of finishing, which allows to change the texture of the surface of the printed products. Make sure that text is transformed into curves. Make internal business field no less than 3 mm and do not dispose meaningful elements. (logotype, contact information and etc.) Closer 3 mm and the edge of maquette. If maquette have elements, suitable in dense to cut lines, departures must be made for the edge of 2 mm on each side of the maquette. Using the RGB in the layout is not permitted! - In your accounts department YOU take letter of attorney. - Don’t forget to take passport or other documents verifying you personality.